Ah, polkadots. You just gotta love 'em, right? Sure, they're sweet and retro and cute, but I'm loving how grown up and modern and chic they are these days too. It seems like the consensus in the blogosphere is that the best way to make polkadots glamorous is to make them gold. Of course we've got polkadot vinyl decals in the shop. And of course you can buy them in any of the 42 colors we've got in stock. 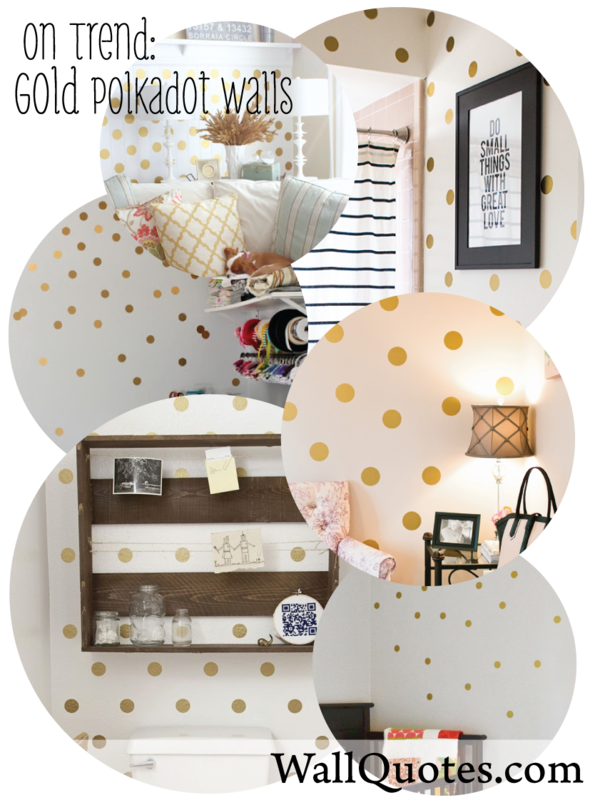 But I'm crushing on the gold polkadots most of all and so today I thought I'd round up some of my favorite seriously chic gold polkadot walls from all over the interwebs and show off a couple of our own while I was at it. You'll be so inspired, you'll want to click over to the shop and get your own set post-haste. For Christmas, for fun, for glam, for whatever. 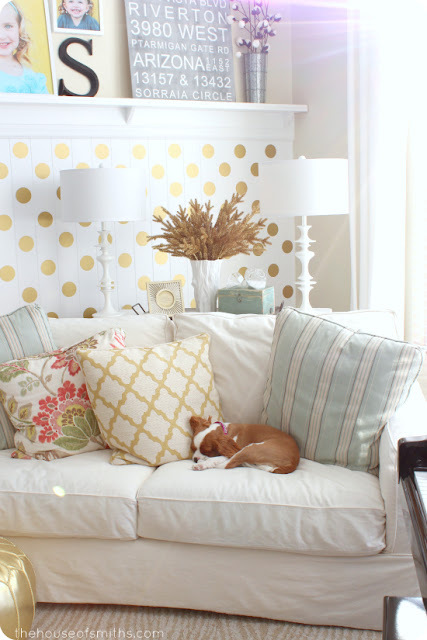 Either way, I bet a little gold polkadot magic'll inspire some serious happy in your space too. 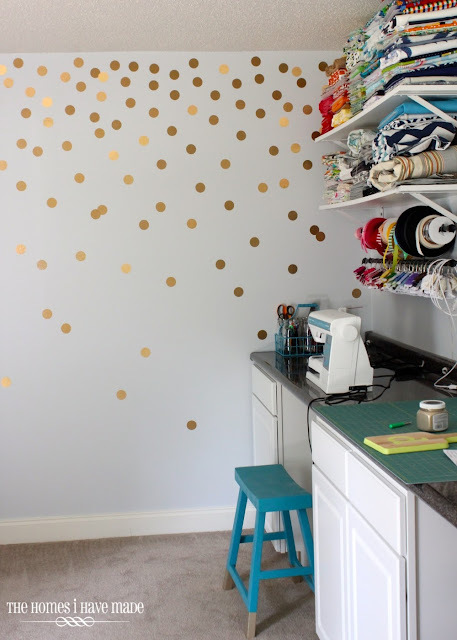 Megan from The Homes I Have Made, did an awesome DIY project with gold contact paper to glam up her craft area. So easy, so worth it. And boy, speaking of glam, have you seen these photos of Laura Reif Bateman's home at The Everygirl? Every room is fabulous and she uses gold as an accent almost everywhere. Uber chic. And yes, even gold polkadot walls! 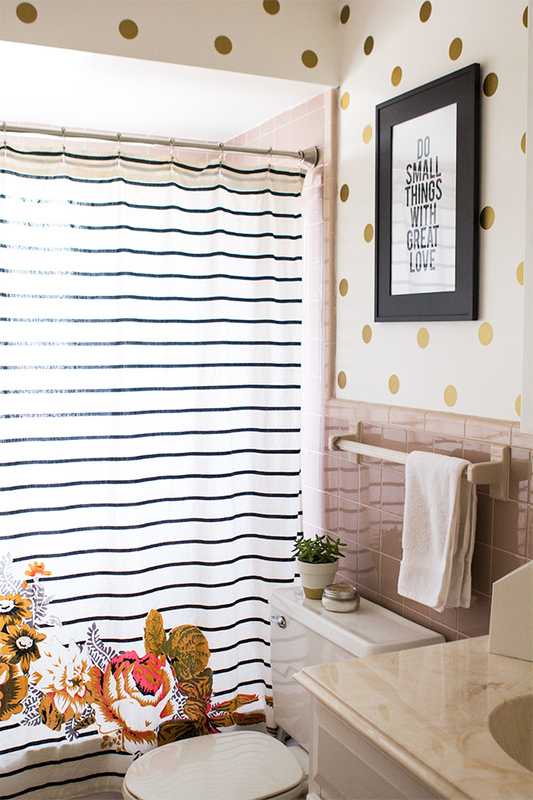 Gold polkadots are the perfect accent in a small bathroom, wouldn't you say? This home, featured on Apartment Therapy, proves that little dots can make a big impact in just a small space. See what I mean? I love how the gold polkadots and rustic elements come together in this little bathroom nook featured on A Beautiful Mess. Cozy happiness, is what it is. Look how perfectly gold polkadots complement the shabby chic/cottage vibe with the pretty pastels and delicate details in this lovely living room. Technically, this post by the gals at House of Smiths was all about Christmas decor and of course gold polkadots make perfect Christmas decor - but doesn't it look great for every day too? Seriously love this look. And gee, we couldn't resist the chance to glam up our own spaces. 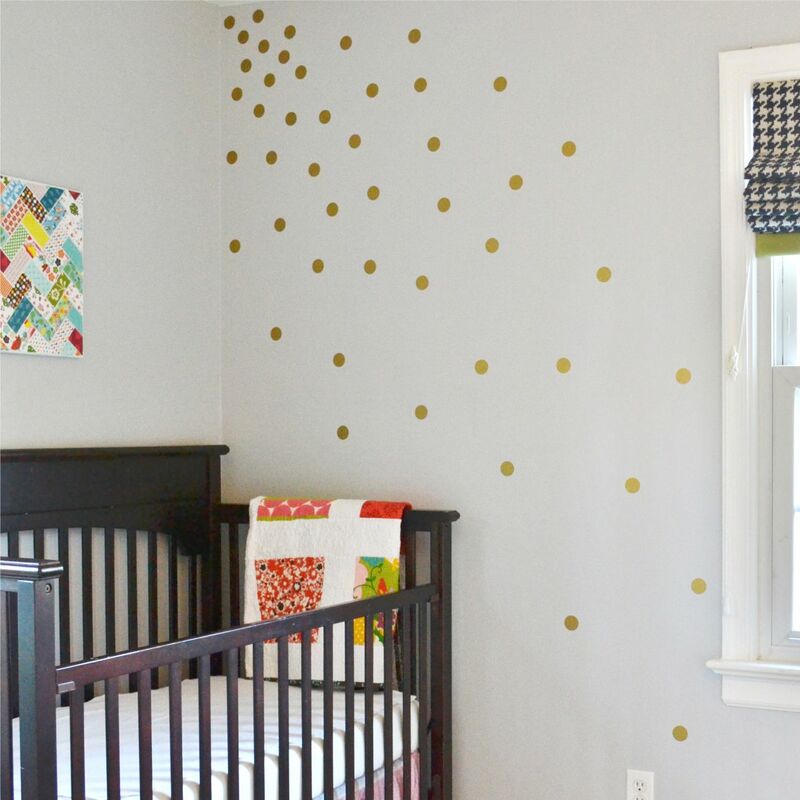 Linda added a little gold polkadot magic to her nursery. I love the cascading pattern down the wall - it's the perfect touch of modern and off-beat and yet fits so well with the other traditional elements in the room like the crib and the quilts. There you have it, gold polkadot walls. What's not to love. Head over to the shop and pick up a set of your own polkadot decals - 152 1" polkadots for $22.95 (way easier than trying the DIY version and at a price that makes it worthwhile). If 1" is a little small for ya, no worries. We've got several other sizes to choose from, or you can always order custom. We love custom requests! Happy polkadoting, folks.